The winter honeysuckle bush (Lonicera fragrantissima) was introduced from China in the mid-nineteenth century, and its delightfully fragrant flowers soon became a favorite with gardeners and landscapers. You can still find unattended stands thriving at crumbling old homesteads and graveyards. Learn more about winter flowering honeysuckle plants in this article. Nip out the flower head from the top of the stem and remove the pair of leaves from the bottom of the cutting. New roots will grow from the nodes where these leaves were once attached. Place the stem in a glass of water deep enough to cover the nodes, but not the leaves at the top. Change the water every two or three days. In three weeks, you should have enough roots to pot up your new honeysuckle. Fill a large pot with potting soil and pot up your cuttings. Leave them growing in the bucket until planting time, which is late winter or early spring. The small, creamy white flowers of the winter honeysuckle bush aren’t outstanding to look at, but what they lack in beauty they make up for in fragrance. The shrub also has a nice shape, and you can use it as a specimen planting, on a trellis, in a shrub border, or as a hedge. The flowers provide winter bees with nectar, and the berries are popular with birds. It’s hard to imagine a landscape plant easier to care for than winter honeysuckle. Give it full sun or partial shade and soil that is not too soggy, and it will thrive. The plants grow 6 to 10 feet tall and just as wide, but you can keep them smaller with aggressive pruning. The best time to prune is right after flowering. Enjoy the rich fragrance of winter honeysuckle indoors by forcing cut stems into bloom. Cut them when the buds have swollen and place them in a vase of water. Winter honeysuckle makes an attractive backdrop for more colorful flowers. 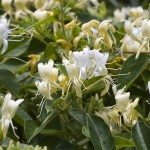 Growing winter honeysuckle shrubs is an easy way to fill your garden with early season flowers and fragrance, but the honeysuckle plants are considered highly invasive in some areas. Birds and small mammals eat the berries from the shrub and carry the seeds they contain to other locations, where they may germinate and quickly overrun native species. It’s best to check with your local Cooperative Extension Agent to make sure they aren’t likely to create a problem in your area. They can also suggest alternative plants that grow well locally.